One skin issue I'm often asked about is blackheads. Contrary to popular assumption, these small black dots aren't the result of dirt getting lodged into pores. So scrubbing your face won't help you avoid them. Nor will extracting the gunk keep them from returning, satisfying though it may be to do so. So here's how can you get rid of them. To get rid of blackheads, you have to know what they are. Blackheads are actually the result of oil or sebum from our sebaceous glands clogging the pores. But because the pore stays open (in contrast to a whitehead), the skin cells and sebum are exposed to air, triggering the oxidation process that turns them dark and black. The good news about having blackheads is that it means you likely also have hydrated, supple skin. But I can understand that this trade-off probably doesn't seem worth it. Fortunately, there are several home remedies that can help you eliminate blackheads without harming your skin's texture. Start by putting two tablespoons of apple cider vinegar into a two ounce spray bottle. Fill the rest with filtered water. At regular intervals throughout the day, spray the mixture on your face. Let it sit for a minute, then gently wipe off any excess moisture. An alternative is bentonite or French green clay. Mix a teaspoon of clay with enough water to make a thin paste. Apply the paste to the affected area, usually that is the T-zone, and let it sit for 10 to 15 minutes before rinsing. Try this three times a week. 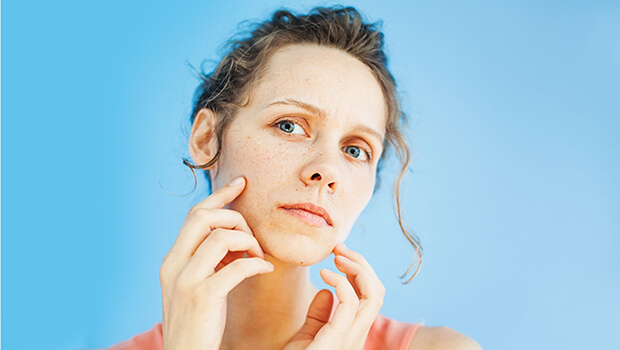 If neither of those options work, you can try applying lemon water, milk and honey, or milk and strong turmeric paste, or a paste of baking soda and water to your face. We're all different, so it's important to experiment and see which treatment works for you. Finally, regardless of what treatment you choose, a great moisturizing option for blackhead-prone skin is the Système 41 Vitamin C Serum. Vitamin C helps stop the oxidation process in its tracks, preventing sebum or skin cells that have accumulated in the pores from darkening. Many of my patients use this serum in conjunction with one of the above treatments. The multiple forms of vitamin C it contains helps with prevention and the hyaluronic acid replenishes moisture without oil, which is helpful since some of these treatments can be a bit drying.